Are you looking for a fun way to tell that special someone you’re nuts about them? 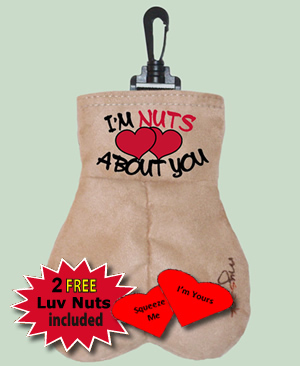 We’ve made it easy for you with this “I’m Nuts About You” Gift ‘Sack.’ Includes two heart-shaped-squeezable “Luv Nuts.” Perfect for Valentines Day or anniversaries. If you’re really a big spender, you may want to add a surprise of your choice inside.